OCCCA is a space that invites artists to think about their practice as research and to develop ideas, exhibitions and projects. It is a space conducive to self-organized initiatives and the sharing of artistic resources. OCCCA recognizes the social and cultural value of artistic experimentation. 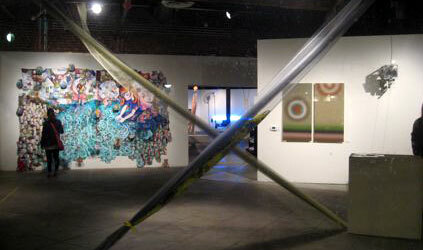 OCCCA serves artists through exhibitions, publicity and publications. OCCCA is committed to honoring the legacy of the alternative space movement by continuing the tradition with new generations of artists. OCCCA presents cutting-edge art within a forward-thinking intellectual framework. OCCCA’s ambitious program of events weaves contemporary art into the fabric of everyday life. Founded in 1980, located in Santa Ana’s Artist Village, OCCCA is a non-profit, 501 (3) c corporation, dedicated to the pursuit of professional excellence in the arts, a constantly changing showcase for artists, educators, and community activists. OCCCA recognizes the importance of social engagement, global networking, intellectual exchange, critical dialogue, and the collaborative process. OCCCA is a think-tank for contemporary art, an incubator of new ideas. The independent artists who operate OCCCA are fond of unfettered experimentation, unafraid of grappling with difficult issues. OCCCA presents exhibitions of contemporary art, along with concerts, performances, art classes, symposiums, and publications. During its thirty-seven year history as an artist-run “alternative space,” OCCCA has exhibited the work of an impressive roster of artists and curators. Participants from all over the world apply to OCCCA’s legendary open calls for art, and fly in from distant cities to attend opening night festivities. The Orange County Center for Contemporary Art (OCCCA) is a 501c(3) non-profit California corporation dedicated to the pursuit of professional excellence and freedom of expression in the arts. Since it's inception in 1980, It provides emerging and established member and guest artists a forum to explore and develop ideas in contemporary art in an atmosphere that promotes experimentation and risk-taking, but without the specter of censorship. In addition, OCCCA develops and actively participates in public educational, outreach and community art services. Orange County Center for Contemporary Art is a corporation operating as an Affiliate-run, uncensored, community gallery since its inception in 1980. OCCCA began through the vision of its five founding members, Richard Aaron, Robert Cunningham, Suvan Geer, Alhena Scott, and Carol Stella. The inaugural exhibition, in September of 1980, featured Slator Barron, George Herms, and Dustin Shuler. OCCCA has continued to function as a nurturing showplace for emerging and mid career member artists from the Orange County area. In addition to members work, OCCCA strives to exhibit a variety of artists work from all media and career levels from emerging through established late career artists. Affiliate members participate in all aspects of professional art practice, including design and installation of exhibitions, public relations/publicity, curatorial, accounting, grant and proposal writing, gallery sitting, facilities maintenance, etc. In its 37 year history, with a membership roster limited to 40 through its current by-laws, OCCCA has exhibited over 1,000 guest artists and held numerous solo, group and juried shows that have showcased more than 6,000 participants. Affiliate members have shown in more than 600 one-person shows and 300 group exhibitions. In addition, the organization has a long tradition of mounting non-member exhibition and performance projects, and inviting outside curators to organize shows. OCCCA exhibitions have consistently received overwhelmingly positive media attention in regional newspapers, including the Los Angeles Times, the Orange County Register, OC Weekly, Riverside Press-Enterprise, art-related publications, and radio and cable and network television broadcasts. Over the years, the scope of OCCCA's programming has expanded to include collaborative and exchange projects with other venues throughout the United States and overseas. With the generous assistance and support of the City of Santa Ana, OCCCA was granted title and moved to its current 6,300 square-foot facility. Ownership and member management and control of our gallery makes OCCCA unique in the world of non-profit arts organizations. In the past six years OCCCA has extended its international reach. The new facility has enabled the planning of more ambitious large-scale projects most notably those in the new media areas. All of this is done in the spirit of voluntarism. This is a pure grassroots organization that works on the passion and creativity of its members, who are artists themselves. Therefore by being a member you are an active participate in its vision and future. We are not beholden to anyone but our standards and community.